VANCOUVER — Most forms of traditional dancing are on the decline in our society, but here in Vancouver, one group of square dancers is experiencing an upswing. 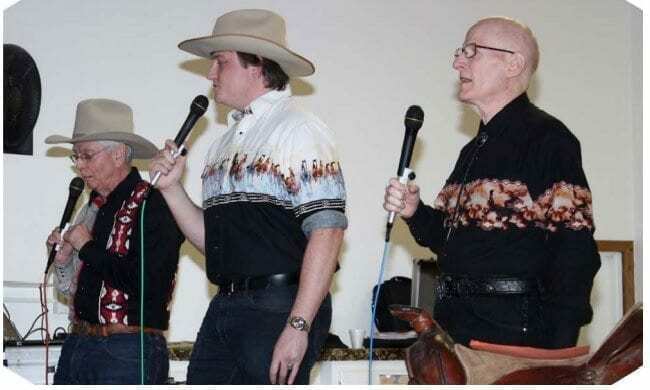 Caller/Cuer Jim Hattrick calls for the Columbia River Dancers, the Happy Hoppers and other groups and has been around a long time. Hattrick started calling 58 years ago in Aberdeen at the age of 12. He went out with some teens to a dance and learned the steps easily. Within six months they gave him a record to learn how to call. Ultimately, he made a living out of teaching and calling dances. Back then, square dancing was all the rage. “The Portland area at one time had 60 to 70 clubs,” says Hattrick, “now there are 25.” He shares that there was a national square dancing convention 30 years ago with 30,000 attendees. That number has gone down every year until five years ago there were only 5,000 in attendance. But Hattrick believes his teaching method is creating more square dancers. Hattrick says that most clubs start lessons once a year and expect students to learn the 68 moves for the mainstream clubs (100 moves for clubs in New York and Los Angeles). Alternatively, his method brings in the beginning dancers in shorter bursts. He starts new lessons every four weeks. In those four weeks he teaches 30 basic moves, such as circle left, right and left grand, a la main left and ladies chain. “All you need to know is arm turns, stars and circles, and I can put all kinds of combinations together,” Hattrick said. Because Hattrick makes it easy, people feel confident and keep with it. He teaches about 100 new dancers a year. Hattrick teaches and calls for both the Happy Hoppers — with 110 members — and the Columbia River Dancers, a newer group with about 40 members. He also calls for a group in Olympia, one in Eugene and does guest calling for other groups, although he’s trying to label himself as retired. “I’m inserting into those songs square dance calls,” Hattrick says. Hattrick is hired on contract as a “caller/cuer.” Cuing is for “round dancing,” such as is called couple dances such as the waltz, two-step, or rhumba. 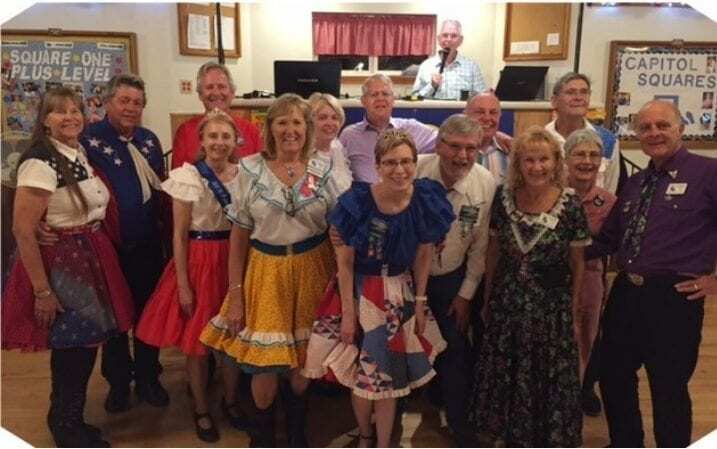 Calls are for square dancing, which requires eight people, and the calls consist of either “patter” or “singing call,” all verbalizing the moves over the background music. The moves called are “random and depend on the choreography skills of the caller. Jim Hattrick is very good,” said Dale Smith, president of the Columbia River Dancers. Smith has only been dancing seven years, but was among the group that started this newer club two and a half years ago. Smith was brought into square dancing by his wife’s father, and at one time had all five of his sons involved. Naturally, he believes square dancing is good for families. The club has started one dancer at eight years old who is now 15 and still dancing. 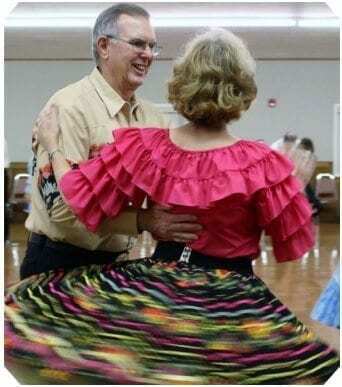 The second part of square dancing is the social aspect, which Smith describes as “therapeutic,” as well as fun. “I have a wide circle of friends I’ve made through square dancing,” he explains. The groups dance, have a break and enjoy potluck treats.